After its launch in May last year, the Herschel Space Observatory throws up its first scientific results. These impressive set of Herschel results were presented to the scientific community at a recent workshop in Madrid, Spain, on 17-18 December 2009. The Max-Planck Institute for Solar System Research (MPS) not only made a significant contribution to the development of the Heterodyne Instrument for the Far-Infrared (HIFI) onboard Herschel, but is also leading the Guaranteed Time Key Program entitled "Water and related chemistry in the Solar System", also known as Herschel Solar System Observations (HssO), and is partner in the Open Time Key Program "TNOs are Cool". Among the many new findings, we would like to highlight the first highly accurate detection of methane at a wavelength of 120 micron on Neptune with the Photodetector Array Camera and Spectrometer (PACS), Fig. 1. Methane plays an essential role in hydrocarbon chemistry of Neptune’s stratosphere. In the past its abundance was known with a larger than one order of magnitude error. Figure 1: Modeled and observed spectrum of Neptune obtained with PACS, red and black lines, respectively. The line is the methane line at 120 micron. Furthermore, also in the framework of the HssO program, a detailed far infrared spectrum of Mars (Fig. 2), and spectroscopic and photometric observations of comet C/2006 W3 (Christensen) were carried out with PACS and the Spectral and Photometric Imaging Receiver (SPIRE), Fig. 3. Figure 2: Modeled and observed spectrum of Mars at 160-190 micron, upper and lower panels, respectively. CO, H2O and its isotopes are detected. A strength of the HIFI instrument is to provide information on excitation processes of the water molecule in cometary atmospheres. HIFI was successfully switched on again on 10th January 2010 after an anomaly on 2 August 2009. Observations of comet C/2008 Q3 (Garradd) carried out with HIFI last July demonstrate the strength of HIFI. 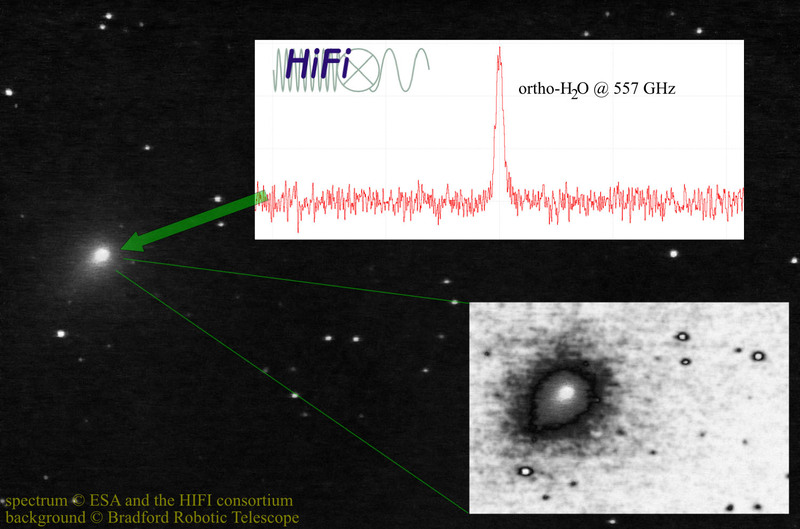 Figure 3: The comet C/2006 W3 (Christensen) observed at 70 micron with PACS. The brightness of comet is due to the dust emission. The image (on the top left) is wider than the one of the Vesta asteroid (on the top right). Lower panels show a comparison of the profiles of Christensen (blue) and Vesta (red). Vesta is not solved. In the framework of the second program, which goal is to characterize about 140 Trans-Neptunian Objects (TNOs), another premiere is the observation of one of the coldest known objects in our Solar System with SPIRE, the dwarf planet 136472 Makemake, Fig. 4. At a wavelength of 250 micron, it appeared much fainter than had been predicted and may be much more complex than had been expected. Thomas Müller, from the Max Planck Institute for Extraterrestrial Physics is leading this project. Figure 4: (135472) Makemake. After combination of two images, the source appears once into positive and once into negative. The Herschel Space Observatory, one of the cornerstone missions of the European Space Agency with participation from NASA, is the only space facility ever developed to cover the far-infrared to sub-millimeter parts of the electromagnetic spectrum (55-672 micron range) to capture the thermal radiation of celestial objects. Performance verification and science demonstration phase activities have been completed for SPIRE and PACS, and both instruments started routine operations. ESA/Herschel "TNOs are Cool" Key Project is partially funded by the Space Agency of the German Aerospace Center (DLR) with the Federal Ministry of Economics and Technology pursuant to a decision of the Deutscher Bundestag under the Project Number 50 OR 0904.